Geneva, 16 October, 2015 – The Aga Khan Award for Architecture today announced the members of the Steering Committee for the Thirteenth Award Cycle (2014 – 2016). Established in 1977, the Award is given every three years to projects that set new standards of excellence in architecture, planning practices, historic preservation and landscape architecture. The Steering Committee is chaired by His Highness the Aga Khan. The other members of the Steering Committee are: David Adjaye, Principal, Adjaye Associates, London; Mohammad al-Asad, Chairman, CSBE, Amman; Francesco Bandarin, Professor, Università Iuav di Venezia, Venice; Hanif Kara, Professor, Design Director and Co-Founder, AKTII, London; Kamil Merican, Principal Designer and CEO, GDP Architects, Kuala Lumpur; Azim Nanji, Special Advisor, Aga Khan University, Nairobi; Gülru Necipo&#287;lu, Director, Aga Khan Program for Islamic Architecture at Harvard University, Cambridge; Brigitte Shim, Partner, Shim-Sutcliffe Architects, Toronto; and Yu Kongjian, Founder and Dean, Graduate School of Landscape Architecture, Peking University, Beijing. Farrokh Derakhshani is the Director of the Award. Geneva, 6 January 2016 – The members of the Master Jury of the Aga Khan Award for Architecture were announced today. The Jury, which independently selects the recipients of the US$ 1 million Award, will convene in January 2016 to select a shortlist from hundreds of nominated projects. The shortlisted projects will then be subject to rigorous on-site reviews by independent experts. The Jury will meet for a second time in June 2016 to examine the on-site reviews and then select the final recipients of the Award. For more information, please see the biographies of Master Jury members. Geneva, Switzerland, 9 May 2016 – The 19 shortlisted projects for the 2016 Aga Khan Award for Architecture were announced today. The projects, which were selected by the Master Jury from amongst 348 projects nominated for the 13th Award cycle, will be competing for US$ 1 million in prize money. The 19 projects are now undergoing rigorous investigations by on-site reviewers – architects, conservation specialists or structural engineers themselves – who visit and evaluate each project first-hand. Their reports are the basis for the Master Jury’s selection of the eventual winners. For a full on-line press kit, which includes briefs on each project, high resolution images, broadcast-quality video (for use by television stations and websites) and other information, please see www.akdn.org/2016Award. The projects are the Manouchehri House in the central Iranian city of Kashan, the Tabiat Pedestrian Bridge and the 40 Knots House, both located in Tehran. The Manouchehri House is a restored 19th century merchant home, which has been converted into a boutique hotel and textile center by Akbar Helli. The house belonged to Saba Manouchehri Kashani. The house also contains textile workshops for brocade, silk, cotton and velvet weaving. In addition, it is home to one of the city’s finest dining establishments, a contemporary art gallery, a handicraft shop and a subterranean movie house. The Tabiat Pedestrian Bridge is a huge infrastructure that connects two parks separated by a highway in northern Tehran. The bridge has become a popular urban space since it was completed in 2014. The 270-meter-long curved bridge was designed by Leila Araqian and was implemented by Nosazi Abbasabad Co. The 40 Knots House is a five-storey building that has been nominated for the award for its façade constructed by bricks based on a Persian carpet design. The structure has been designed by Habibeh Majdabadi and Alireza Mashhadi-Mirza. The 19 shortlisted projects for the 2016 Aga Khan Award for Architecture were announced earlier this month. The projects, which were selected by the Master Jury from amongst 348 projects nominated for the 13th Award cycle, will be competing for US$1 million in prize money. Thirty years ago, as the eye ranged across most of the developing world, it was difficult to find new construction that reflected in its design a concern much less an understanding of the social, cultural, or in some cases, even the climatic context in which it was built. I was particularly disturbed to find this in the Islamic world, given its historical record of architectural achievement and the special place that architecture has played in the aesthetics and spiritual expression of its cultures. The gap between past accomplishment and current practice was massive. This recognition led to the establishment of the Award. 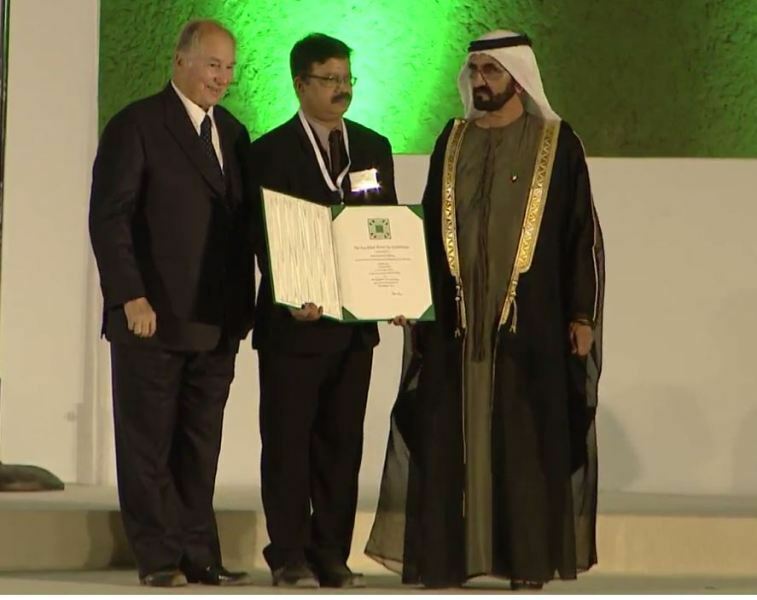 History of the Award This is the 13th cycle of the Aga Khan Award for Architecture, which began in 1977. Since the award's inception, 110 projects have won. The prize fund currently stands at US$1 million. The Chairman’s award has only been given 4 times. Award Eligibility There are no fixed criteria for the type, nature, location, or cost of projects to be considered, although eligible projects must be designed for or used by Muslims. All types of building projects may be submitted from bus stops to sky scrapers. Previous Winners Recipients of the Award span the globe and are composed of many famous sites and landmarks. Winners of note include The Old City of Jerusalem, the Petronas Towers in Kuala Lampur, the Kuwait Towers in Kuwait City and the Nubian MuseumAswan. As part of the regeneration of an old industrial area, a new building echoes a recently restored power station beside it. Ventilation and the play of light make this neighbourhood mosque a refuge for spirituality. A rural training centre inspired by one of the country’s oldest urban archaeological sites. A small-scale project that enriches bonds amongst communities and revives Hutong life. A public space promoting integration across lines of ethnicity, religion and culture. The combined reinvigoration of the architectural and craft-work heritage in an old city has sparked a broader revitalisation. Infrastructure that connects two parks has become a popular urban space. Innovative low-cost techniques that reinterpret traditional brick facades. An abandoned quarry serves as catalyst for an imaginative intervention providing educational programmes and visitor facilities. A series of public libraries for disadvantaged youth in rural areas. A new building, radical in composition but respectful of its traditional context, "floats" above an exterior courtyard. A powerful architecture, playing with the contrast between inside and outside, achieves the dignity essential to educational institutions. A dynamic transport hub that anticipates the needs of the city of the future. An alternative building system that provides space for education and cultural programmes in Africa’s coastal regions. The varying patterns of the exterior envelope of this office tower evoke mashrabiyya, and serve as protection from the sun. An imaginative expansion that doubles available space and provides a new skin for an existing structure. An ecologically sensitive meeting place demonstrates how art and architecture can be part of rural life. A restoration enhanced by modern design elements and sensitivity towards its built and natural environment. Incorporating an archaeological site as a key feature of the building, this library has become a cultural landmark. The shortlist for the Aga Khan Award for Architecture, which includes a floating school in Nigeria, a series of micro-libraries in Kosovo, and an artist’s centre in Senegal, demonstrates how great design and social good go hand in hand. 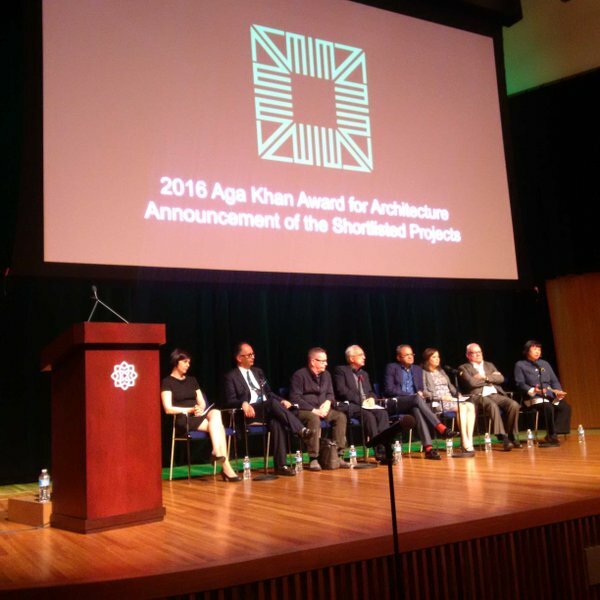 On Saturday, members of the steering committee of the Aga Khan Award for Architecture, including Hanif Kara, Azim Nanji and Brigitte Shim, gathered at the Aga Khan Museum in Toronto to celebrate the shortlist of the 2016 Aga Khan Award for Architecture. The 19 projects were presented in short films, grouped together by theme. Indeed, many of these stellar buildings have much in common, whether they balance preservation and modernization, local fabrication and innovative techniques, and social and environmental aspects. As Brigitte Shim, also a founding partner of Toronto firm Shim-Sutcliffe, noted, the projects also show how architecture can be a collaboration among non-profits, activist architects and communities. Among the projects shortlisted for the US$1-million prize, which will be announced in June, is the Makoko floating school by Kunlé Adeyemi, who based his design on the stilt-supported homes on water of the Makoko community in Lagos. Local fabrication techniques also inspired Toshiko Mori’s Thread artists centre in Sinthian, Senegal, although its undulating roof and offset brick lattice-work facade balance the thatched roof and tiled vernacular with a modern rigour. In Kosovo and in Beijing, two projects meant to accommodate children also got nods: the Bunateka libraries and the Micro Yuan’er Children’s Library & Art Centre. AREP and Groupe 3 Architectes designed the Casa-Port New Railway Station for Casablanca. The building, which opened in 2014, lets light in through a hypostyle roof with generous skylights. Larger projects, like Tehran’s Tabiat Pedestrian Bridge and the Casa-Port New Railway Station for Casablanca turn major infrastructure works – in essence, thoroughfares – into places where people can congregate and hang out. The shortlist also includes big names: Zaha Hadid Architects’ Issam Fares Institute for Public Policy and International Affairs, in Beirut, with its cantilevered form hovering over a public square; and Atelier Jean Nouvel’s Doha Tower in Qatar, with its high-tech mashrabbiya envelope filtering in light and shadow. BIG also made the shortlist with its Superkilen park in Copenhagen, inspired by the various ethnic groups that inhabit the neighbourhood. Friendship Center, in Gaibandha, Bangladesh, was designed by Kashef Mahboob Chowdhury / URBANA and completed for the Friendship NGO in 2011. It is a rural training centre inspired by one of the country's oldest urban archeological sites. Friendship Center, in Gaibandha, Bangladesh, was designed by Kashef Mahboob Chowdhury / URBANA and completed for the Friendship NGO in 2011. It is a rural training centre inspired by one of the country’s oldest urban archeological sites. At the event on Saturday, George Baird, who along with Shim and fellow panelist Aziza Chaouni, are also professors at the University of Toronto’s Daniels Faculty of Architecture, Landscape and Design, noted that the Aga Khan Award has always empahisized the social and environmental aspects of architecture – long before many other awards programs. And that influence is now clear – it can be seen in the choice of Alejandro Aravena as this year’s Pritzker Prize recipient. The award winning, Aga Khan-shortlisted Makoko Floating School in Lagos, Nigeria has collapsed, reports Nigerian news website NAIJ.com. Torrential rainfall brought down the structure on Tuesday, though, fortunately, no casualties were reported. Designed by Nigerian architect Kunlé Adeyemi (of NLÉ) and built in collaboration with Makoko/Iwaya Waterfront Community and the United Nation Development Programme (UNDP) in 2013, the three-level A-frame school accommodated over 100 school children and their teachers in Makoko, a settlement built over water in the Lagos Lagoon. After three years of use, the school was decommissioned in March to make way for upgrades, and students relocated to another building, according to a statement from NLÉ. The architects, community, and potential stakeholders were already in the process of considering upgrading the structure with a new iteration of the structure, MFS II, which is currently on view at the Venice Architectural Biennale and received the Silver Lion award for a Promising Young Participant last week. NLÉ and Makoko community greatly appreciate the concern and support received from so many people following the news alarm about Makoko Floating School. We are glad there were no casualties in what seemed like an abrupt collapse. The prototype had served its purpose in time and we look forward to the reconstruction of the improved version amongst other greater developments of the community. Where and when will be the Award ceremonies for this round? If the awards held in a country worth visiting by us.Can a groups of Ismailis get to attend the award ceremony? How does one get invite or passes of it? I wish that Iran or Azerbaijan to host such in near future. It is all by invitation, very difficult to get in. Sometimes miracles happen, it all depends on the mercy of Imam. I have seen and met people who travelled thousands of km just to have a glimpse of the hand of the Imam giving blessings though the tinted window of his car for a split seconds and they were happy. Connectivity between people, adapting to new contexts and responding to climate challenges stand out as notable themes among the winners of the 13th cycle of the Aga Khan Award for Architecture. 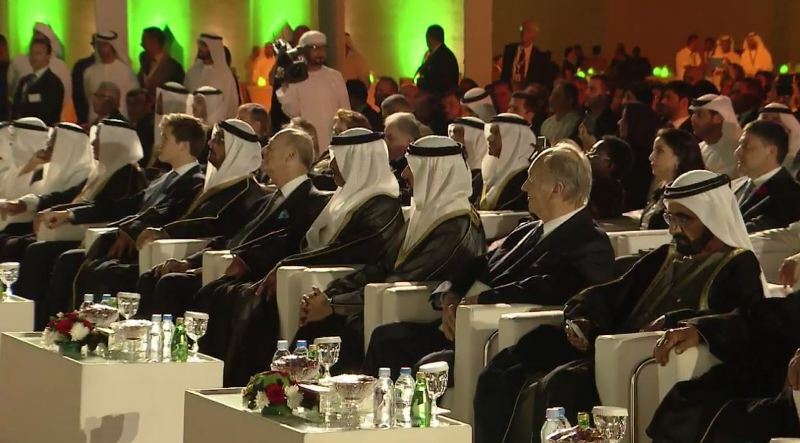 The six recipient projects were announced in Abu Dhabi today, along with the venue of the award ceremony. 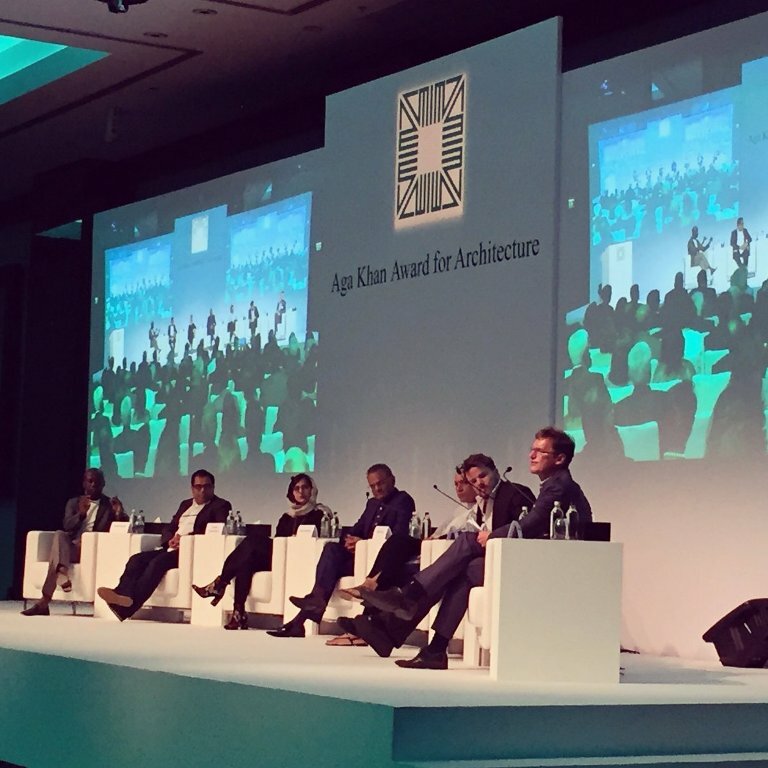 Abu Dhabi, 3 October 2016 — The winners of the 2016 Aga Khan Award for Architecture were announced today at a press conference held in the United Arab Emirates. Blurring conventional boundaries, the six recipient projects from five countries offer creative responses to contemporary issues. The Award will be presented at a ceremony to be held in November at the Al Jahili fort in Al-Ain. The venue was announced by His Excellency Awaidha Murshed Al Marar, Chairman of Department of Municipal Affairs and Transport and a member of the Executive Council of Abu Dhabi. In this 13th cycle of the Award, the Master Jury “embraced the notion of plurality, exploring not just projects in diverse contexts but the boundaries of the discipline itself, recognising that new knowledge sometimes emerges in the lines between categories,” according to their written statement. Connectivity between people, adapting to new contexts and responding to climate challenges are notable themes among the winning projects. The three-level Tabiat Pedestrian Bridge in Tehran is a three-dimensional truss that curves its way between two green spaces across a busy highway. Respectful of its natural surroundings, the bridge’s columns mimic the arboreal form and at one end the structure opens up to permit trees to grow through it. But the bridge itself is also a place of gathering and respite, offering restaurants and seating areas that make it a popular destination rather than simply a connecting structure. In Copenhagen, the Superkilen park wedges itself into a socially challenged neighbourhood that is predominantly Muslim and increasingly diverse. Drawing on themes of gardens and amusement parks, the whimsical green space incorporates pedestrian and cycle paths that connect the neighbourhood with important traffic arteries. Public lighting enhances security, and the inclusion of 108 objects from 62 countries — such as a fountain from Morocco, chess tables from Sofia and basketball hoops from Mogadishu — offers newly arrived families connections with places from their pasts. In the flood-prone flatlands of rural Bangladesh, permanent structures are normally built 2.4 metres above the ground — at significant cost. The Friendship Centre training facility in Gaibandha didn’t have that kind of budget; instead the architects surrounded it with an earthen embankment. This presented challenges — such as an absence of horizontal light — but also opportunities. Rainwater is collected in tanks and absorbed by green covered earthen rooftops that also act as insulators. Mindful of the seismic zone in which it is situated, the builders sensibly reinforced the structure with concrete. The other winning projects are the Bait Ur Rouf Mosque in Dhaka, Bangladesh; the Hutong Children’s Library and Art Centre in Beijing, China; and the Issam Fares Institute in Beirut, Lebanon. Profiles and photographs of all the projects can be found at the Aga Khan Development Network website. Mawlana Hazar Imam established the Aga Khan Award for Architecture in 1977 to identify and encourage building concepts that successfully addressed the needs and aspirations of communities in which Muslims have a significant presence. Over the past 39 years, prizes have been given to 116 projects across the world, from France to China. A monograph for the 2016 Award will be published by Lars Mu&#776;ller Publishers in November. Titled Architecture and Plurality, it includes essays on issues raised by the Master Jury’s selections of the shortlist and the winning projects. As the winners of the 13th cycle of the Aga Khan Award for Architecture were announced, TheIsmaili.org’s Elisha Nathoo sat down with Professor Hanif Kara, a member of the Steering Committee to talk about what the Award has achieved in the nearly four decades since it was established. A practicing structural engineer, design director and co-founder of ACT II, a London-based engineering firm, Kara is also a professor in the Practice of Architectural Technology at Harvard’s Graduate School of Design. In 2011 he was the first engineer to become a judge for the annual RIBA Stirling Prize and has been a review panel member of the National Centres of Competence in Research at ETH Zurich since 2015. He has also served in previous cycles of the Aga Khan Award as a technical reviewer and a master juror. 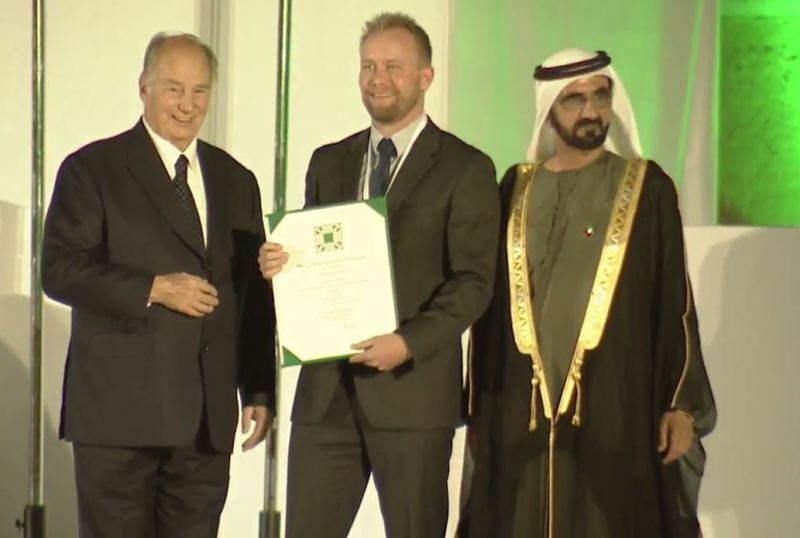 Elisha Nathoo (TheIsmaili): Forty years ago, why in your view did Mawlana Hazar Imam establish the Aga Khan Award for Architecture? Hanif Kara (HK): There was a core recognition that architecture matters beyond providing shelter. It shows societies’ intentions. It makes life better and has an astonishing power to balance nature and man’s effect on it, the individual and community, and past and present. [Mawlana Hazar Imam] often reminds us still that some form of destruction or construction was continuously taking place daily throughout the Muslim world — the implication of which is that we are always building, and the built environment is therefore very important. Uniting the ummah through architecture and improving quality of life are among the key objectives of the manifesto of the Award. As we know; improving the built environment is one of the fastest ways to improve quality of life. Our environment shapes us all in different ways — from what we sleep in, educate in, shop in, pray in — whilst underscoring our technologies civilisations, identity and cultures. So an award that recognises great icons through to schools and small shelter would add value to Muslim communities and society at large. TheIsmaili: What has the Award achieved in that time? HK: The AKAA is considered to be one of — if not the most — important awards in the field of architecture due to its ethos towards the built environment, multi-disciplinary approach and level of rigour. The Award thinks long term, so by looking at it through its achievements over the last 40 years we can get a much better measure... undeniably it has played a big role in changing not only architecture, but societies and influenced our progress as a community. If we examine the smaller winners from this cycle like the Bait Ur Rouf Mosque and the Friendship Centre (both in Bangladesh) you will see that the quality of construction through a deliberate simplicity is incredible — which is related to the quality of life of those who use these buildings, but also those who designed and made them, and the nation as a whole. We all know that wellness of the mind and body is connected to space. I think Mawlana Hazar Imam, almost as far as 40 years ago, wanted to set standards of quality through examples that would inspire designers, builders and clients alike in the Muslim world. Sharing good projects for the Award allowed us to build strong foundations and benchmarks to build upon every cycle. The Award raises the standard of education in general. Not long after it was established, the graduate programmes addressing the built environment at MIT and Harvard were started. There is also a set dissemination plan to academic institutions around the world through online literature, publications, talks, and seminars. As a result of the rigorous selection process, an extensive database has been built up. This database at www.archnet.org is openly available for public use. So much data has been collected about how buildings behave, urban contexts, Islam and Muslim societies. The history of certain parts of the world can been tracked and mapped out, like in Aleppo for example. The Award is not only illuminating architecture as a practice but enhancing the whole basis on which architecture should be developed. It’s not just a discipline, nor is it just a science, nor just an art; it’s a way of life. It’s achieved a lot for academia, for the people of the countries where projects have won the award and for the people who have won it. These practitioners then go on to become great architects and advocates for the way we think and the way in which architecture matters at social and political levels too. TheIsmaili: How does the Award speak to the values of Islam? HK: Time and time again the Awards demonstrate through wider goals the ethic of inclusivity and diversity as a strength. This cycle illustrates these principles in many ways whilst showcasing pluralism in the context of architecture. Coincidentally three out of the five winning projects in this cycle have been designed by women. What we see explicitly is inclusivity, which is not forced or artificial. Diversity can be seen through the variety of projects in terms of typology, end users, scale and context. For example, this cycle the winners range from a mosque in Bangladesh, a very small library in China to two major infrastructural projects: Superkilen in Copenhagen and a bridge in Iran. Diversity is also reflected in the wide range of professionals involved in the selection and review process, and their educational and cultural backgrounds. The park in Copenhagen encourages social cohesion through a noble civic purpose giving a sense of oneness — ownership is between young and old from 60 different communities that live, play and socialise there. The bridge project in Iran has transformed the way of life for people by generating interaction and exchange. It encourages you to visit it as a destination and stay — not just pass through — which is phenomenally different to how a bridge is normally conceived and used. TheIsmaili: How does the Award stay current and relevant? HK: I think it’s an interesting time: with so much disruption in societies with a majority Muslim population, and the destruction of symbolic architectures of significance to Muslims in places like Syria and Afghanistan. Projects like Superkilen and the Cemetery (2013 cycle) that are for Muslim communities — which are a minority in the population they live — is a new dimension that the Award is seeking to address. It is looking at the migrant and the diaspora across the world. This demonstrates the flexibility of the Award. The harmonising essence and the core structure were conceived at the outset to cope with the problems of their time without ever ignoring the problems of yesterday. Previously there used to be a lot of discussion about AKAA being just for the poor, just for historic preservation and restoring old buildings. However, when you look over the 40 years it’s been much broader in embracing ever changing conditions. The structure of the governance for the Award lends itself to this flexibility. The Master Jury sit for one cycle only to ensure the autonomy of each cycle whilst the Steering Committee (which sits above the Master Jury) together with Hazar Imam as the Chair set the guidance of the current time that the Award should seek to engage with. The Steering Committee often serve for multiple cycles as many of the committee members are involved with other AKDN activities — like the AKTC Historic Cities Programme — enabling knowledge transfer and sharing of best practices. The Jury though selected meritocratically by the Award office and director Farrokh Derakhshani, with the steering committee, ensures very deliberately a multi-disciplinary group. Several of them are always Muslim and several are women. Most people aren’t aware of the multiple gates each of the winning projects has to go through. The extent of investigation undertaken by the selection process of the Award makes it extremely current and relevant. The Master Jury selects the shortlist, which are fully and thoroughly reviewed by technical reviewers, who then report back to the Master Jury. During this process the Master Jury are provided with a brief and then left autonomous to select the winners. Decisions are therefore final, even if the Steering Committee doesn’t like it. The six award recipients, arrived at after long and sometimes heated discussion, accurately reflect the wide range of entries: a pedestrian bridge that privileges use over form; a sacred space that plays inventively with tradition; a project that is at once landscape and building; a bold, contemporary insertion into a traditional setting; a diminutive library operating on a much larger micro-urban scale, and an urban park that provides new forms of public space. They include two buildings in Bangladesh, and one each in China, Denmark, Iran and Lebanon. “Unique among architecture awards, the Aga Khan Award seeks projects across a vast range of contexts, cultures and conditions. Throughout its history, it has also celebrated works that straddle the sometimes uneasy divide between tradition and modernity," said the master jury chaired by Prof Luis Fernández, a lecturer at the School of Architecture of Madrid’s Universidad Politécnica, and the editor (since 1985) of the journals AV/Arquitectura Viva. The winners were announced on October 3, 2006, in Abu Dhabi, United Arab Emirates. A ceremony to celebrate them will be held at the Al Jahili Fort in Al-Ain in November. In its statement, the jury said that in seeking the winners, they embraced the notion of plurality, exploring not just projects in diverse contexts, but also the boundaries of the discipline itself, recognising that new knowledge sometimes emerges in the lines between categories. Where is the award giving ceremony are being held for 2016 cycle.? "The Award will be presented at a ceremony to be held in November at the Al Jahili fort in Al-Ain. The venue was announced by His Excellency Awaidha Murshed Al Marar, Chairman of Department of Municipal Affairs and Transport and a member of the Executive Council of Abu Dhabi. " Is it true that the awards ceremony is on 06th of November? I got this information from an Ismaili family staying in Al Ain,UAE. Any official announcement of dates as they say it came in local newspaper few days back there. The Aga Khan Award for Architecture celebrates new structures around the world that successfully address the needs and aspirations of the societies they serve. The award originated in the Middle East origin and is given every three years. It focuses on communities where Muslims have "a significant presence." It's considered one of the most important awards in architecture and past cycles have recognised mosques in Austria, surgery centres in Sudan, and historic bazaars in Iran. This year, 348 nominations were whittled down to find just six winners which were announced at a ceremony in Abu Dhabi. It is in the first week of November. Why all the secrecy on the date of a public even anyway... paranoia! 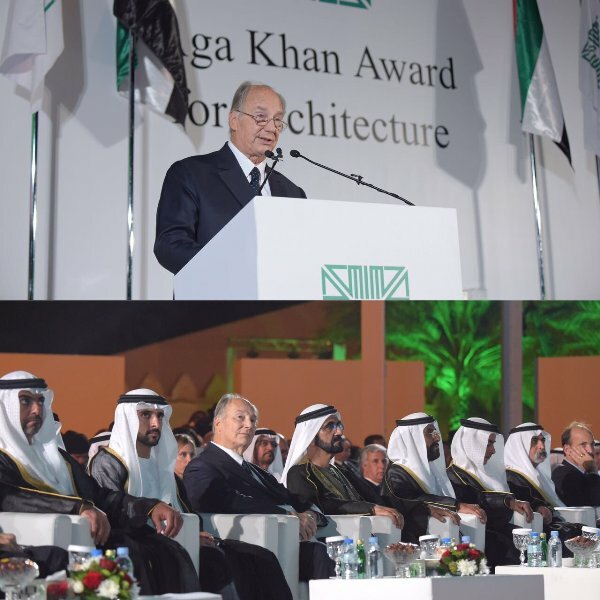 Anticipation has been growing in the United Arab Emirates since the announcement in October that the country will host the presentation ceremony of the 2016 Aga Khan Award for Architecture. 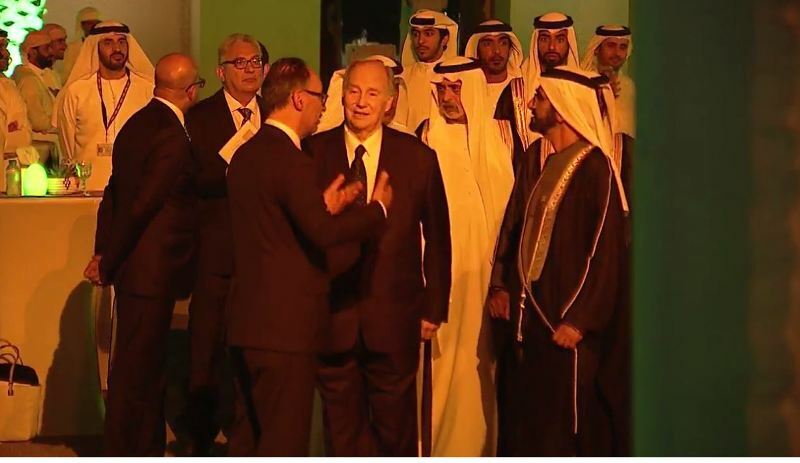 Mawlana Hazar Imam’s arrival in Dubai ahead of the weekend’s events is adding to the excitement. The award ceremony takes place on Sunday and will be held at at the Al Jahili Fort, a World Heritage Site in Al Ain. Located in the Emirate of Abu Dhabi, the garden oasis of Al Ain is the fourth largest city in the country and the birthplace of the nation’s late founder Sheikh Zayed bin Sultan Al Nahyan (1918–2004). It is said that the values that shaped the ruler during his childhood in this area are those with which he forged the peoples of the United Arab Emirates into a nation. It is therefore apt that the city should host the Aga Khan Award, which prizes architecture for the values it embraces above all else. And “people” are central to those values, as Rozina Padamsee learnt at an information session about the Award held at the Ismaili Centre, Dubai. Organised by the Ismaili Council for the UAE, the information session recounted the history and background of the Award, the role of the Steering Committee and the Master Jury, the processes that guide the selection of projects, and the criteria for finalising the winning projects. Attendees watched videos about the six winning projects and had an opportunity to discuss the merits and diversity of the projects. The presentation also raised seminal questions about the concerns and issues that guide the discussion of the built environment in Muslim cities, and how Muslim architects can be inspired by the rich legacy of Islamic architectural heritage to build meaningful public spaces for cosmopolitan societies. Last weekend, some 40 Ismaili youth from across the UAE travelled to Al Ain to visit the Al Jahili Fort, which is currently hosting a public exhibition about the winning projects from the current cycle of the Aga Khan Award for Architecture. Ten-year-old Hasnain Ali gained a better understanding of the Award and its impact. “I learnt the reason and significance of the work of the [Aga Khan Award for Architecture] and how it preserves culture and encourages others to build such effective structures,” he says. He also had a chance to find out about some of the cities that hosted past cycles of the Award, and was impressed with the venue for the 2016 ceremony. “The fort was beautiful," he says. For Ali Zain Babul, who is 14, the visit shed light on how the selection process keeps community needs at the forefront. “I especially liked how in Zaha Hadid’s project, the building worked around nature and did not interfere with the trees that were already on the campus,” he said, in reference to the Issam Fares Institute at the American University of Beirut. The local Jamat will gather on Saturday to celebrate and watch a specially curated video about the Award proceedings. Together with many people across the UAE and around the world, they will be paying keen attention to Sunday’s award ceremony. Mowlana Hazar Imam attended in Dubai the event on this 5th of November with Prince Amyn and his sons Prince Husain and Prince Aly Muhammad . Look at the video of the Noorani family leaving the auditorium after the event. Few seconds of the end of the speech, taken by unknown person in the audience. Hazar Imam asking to think how we can better manage the environment for the future. Dubai: Climate change threatens to wipe out areas of the Islamic world within two decades, the spiritual leader of around 25 million Muslims said on Saturday. “We’re seeing villages are being wiped away by earthquakes, by landslides, by avalanches, we’re seeing people moving to dangerous areas in modern environments.” And with more people living in cities than ever before, many end up living in dangerous, unsafe conditions, he added. The 79-year-old spiritual leader told the audience, made up mostly of urban planners and architects gathered from around the world, that they can help. More work needs to be done to educate people living in threatened areas — and more research done to better predict future crises, he added. The Aga Khan, who was born in Geneva but today spends much of his time in Paris, is the current leader in a centuries-long dynasty which claims spiritual authority over Esmaili Muslims. Many members of the Esmaili sect are scattered across Pakistan and India, while others live in Central Asia and the West. 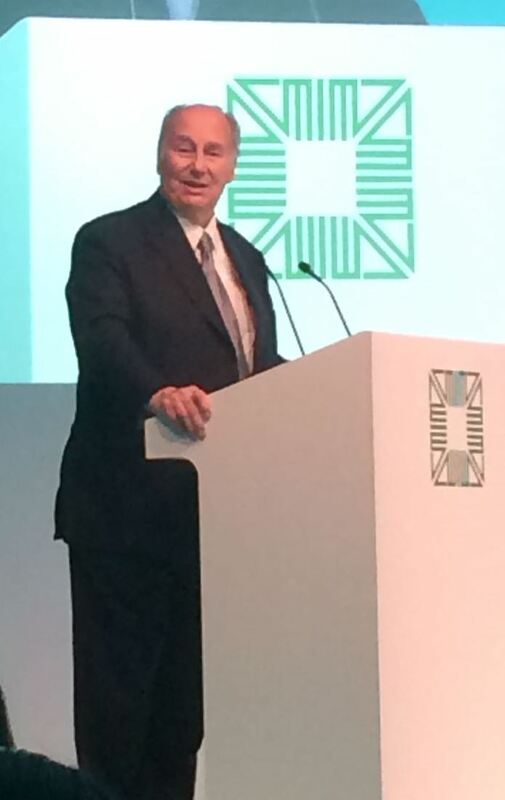 As part of his role, the Aga Khan runs a non-profit Dh2.3 billion development network which aims to boost developing countries. One of these arms, the Aga Khan Award for Architecture, seeks to promote buildings and structures that benefit Muslim communities. The award, which started in the late 1970s, hands out Dh3.67 million every three years to the architects and clients behind the winning structures. The six winners of this award cycle include a mosque and social space in Bangladesh, a children’s library in China, an urban park in Denmark, a university building in Lebanon, and a bridge in Iran. The architects and backers of the six winning projects will be awarded at a ceremony held on Sunday at a historic fort in Al Ain. The current batch of winning projects shows how Muslim communities have spread across the world, said Mohammad Al Asad, a member of the award’s steering committee. The committee is a de facto board of trustees chaired by the Aga Khan. “The world is changing drastically, [and] we have become more interested in issues relating to infrastructure, urbanism, to multiculturalism, to the presence of Muslim communities in diasporas,” the Jordan-based urban planner said. And despite a critical need, regional conflicts that have caused millions to flee Muslim-majority countries, few useful structures and buildings had been designed to help them, Al Asad added. “You have large numbers of people being displaced, and a number of projects were submitted that addressed this issue, but I don’t think the jury felt they were of the quality that [they wanted],” he said. Who is the Aga Khan and what does he do? As well as being the spiritual leader of millions of Esmaili Muslims, the current Aga Khan has for five decades lead a huge charitable foundation, the Aga Khan Development Network. The network is a group of private development agencies aims to improve living conditions and opportunities, with a focus on central and south Asia and sub-Saharan Africa. With an annual budget of Dh2.3 billion, the foundation claims to work for the common good of everyone, regardless of their gender, origin or religion. One of the foundation’s arms is the Aga Khan Award for Architecture. 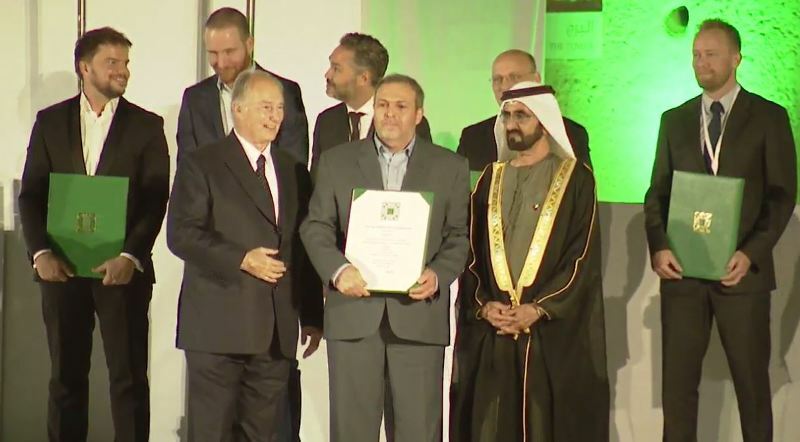 Every three years, the award gives out Dh3.67 million in prize money to the architects and backers of buildings and structures around the world that benefit Muslim communities. The award, considered one of the most generous competitions in architecture, has been running for close to four decades. Entre uma mesquita em Daca, no Bangladesh, uma biblioteca e centro de artes em Pequim, China, um parque público em Copenhaga, Dinamarca, uma ponte pedonal na capital iraniana de Teerão, um instituto universitário em Beirute, Líbano, ou um centro comunitário em Gaibandha, no norte do Bangladesh, Farrokh Derakhshani só ainda não conseguiu visitar este último. São os seis projetos vencedores do Prémio Aga Khan de Arquitetura, o galardão atribuído desde 1977, de três em três anos, ao melhor que a arquitetura faz pelas comunidades muçulmanas do mundo inteiro. Derakhshani é o diretor. Integrado no Fundo para a Cultura Aga Khan, do príncipe que é líder espiritual da comunidade ismaili - minoria muçulmana xiita - em todo o mundo, o prémio foi entregue na sua penúltima edição, em 2013, no Castelo de São Jorge, em Lisboa. Cidade, aliás, que o atual príncipe Aga Khan, o 49.º imã da família, visitou em maio último, altura em que se ficou a conhecer o lugar da futura sede da Fundação Aga Khan em Portugal: o Palácio Henrique Mendonça, na capital. Olhar para os galardoados com o prémio que, em 1982, mudou para sempre o olhar de Farrokh Derakhshani sobre a arquitetura é fazer uma espécie de volta ao mundo em seis tempos. Os seis responsáveis por tal acontecimento, que dividem entre si um milhão de dólares (cerca de 919 mil euros) do prémio, foram selecionados entre 348 projetos, de 69 países, e venceram numa lista final de 19. Derakhshani - que estudou arquitetura no Irão e, mais tarde, em Paris - vive na Suíça, país onde nasceu o atual Aga Khan, e talvez por isso se tenha desculpado de forma tão insistente pelo ligeiro atraso que o trânsito de Lisboa causou na sua chegada ao Palácio Pombal, onde, integrada na Trienal de Arquitetura, está patente até 11 de dezembro uma exposição com os projetos finalistas do prémio. É ali que afirma: "Agora o discurso mudou, mas, quando eu estava a estudar, a arquitetura era sobre estética e sobre a forma como o edifício era construído. O lado social da arquitetura, a razão pela qual era construída, era secundário. Mas aqui vemos como é usada, concebida e entendida pelas pessoas. Em vez de olharmos para as fotografias do projeto, vamos lá, falamos com as pessoas que o usam, e vemos se depois de um, dois ou três anos elas ainda estão contentes." Falamos de um prémio que nesta edição distinguiu um projeto de Zaha Hadid, a arquiteta que morreu em março último: o Instituto Issam Fares, que pertence à Universidade Americana de Beirute. No passado distinguiu nomes como Jean Nouvel, Frank Gehry ou Norman Foster: todos são hoje arquitetos-estrela, todos, como Hadid, galardoados com o prémio Pritzker, considerado o Nobel da Arquitetura. Muito cordial, Derakhshani pede que não repitamos o que dizemos quando o questionamos se, no início da história do prémio, alguma vez o imaginou assim, um dos mais importantes da área, logo abaixo do Pritzker. "Este prémio foi criado antes do Pritzker, e não o damos a celebridades, damos a projetos. Muitos arquitetos tornaram-se muito famosos depois de receber este prémio. Não acreditamos que só um mestre da arquitetura pode criar arquitetura. A mensagem por detrás disso, a do edifício, é o resultado que devemos reconhecer." E se há expressão do que Derakhshani acabava de dizer, ela chama-se Superkilen. O parque em Nørrebro, bairro de Copenhaga maioritariamente muçulmano, tem agora um banco de baloiço que veio de Bagdade, uma fonte com a forma de uma estrela de oito pontas que veio de Marrocos, e mesas de xadrez de Sofia, Bulgária. E não foi o grupo de arquitetos dirigido por Bjarke Ingels, vencedores do prémio, quem escolheu aqueles elementos, como os restantes 117 como eles. "Como arquitetos nós quase assumimos o papel de curadores, para comissariarmos as propostas que vinham do público", explicou ao DN o arquiteto dinamarquês. "Demos um passo mais à frente: dos encontros públicos, redes sociais, campanhas publicitárias para encorajar as pessoas a recomendar elementos do seu país de origem, a caixa de correio gigante no meio da praça onde as pessoas podiam submeter propostas, até às interações diretas com a comunidade", continua. O júri do prémio Aga Khan viu esse "passo em frente". Com o dinheiro do prémio, adianta Ingels, "talvez seja interessante documentar agora algumas das histórias do que acontece em Superkilen." Num trabalho desenvolvido com o grupo de artistas Superflex, o Bjarke Ingels Group contactou ainda diretamente, durante o processo, com cinco pares "pouco representados nas reuniões locais". Entre eles, "um rapaz jamaicano e o seu amigo, uma rapariga palestiniana e a sua amiga, e um velho casal dinamarquês." O resultado é um parque onde se ouvem 120 vozes e que, visto do ar, se divide em três cores: a zona vermelha, para o mercado e a cultura, a zona preta, que é uma espécie de sala de estar urbana, e a verde, dedicada ao desporto e diversão. Ainda com Derakhshani, falamos de Suad Amiry - a arquiteta e escritora palestiniana que nesta edição integra o júri do prémio - a propósito da arquitetura e do mundo muçulmano atual - pense-se no seu livro Sharon e a Minha Sogra, que conta 42 dias de cerco israelita - quando Derakhshani lembra que ela mesma, com a fundação que criou, a Riwaq, venceu o prémio em 2013 pela reabilitação do centro histórico de Birzeit, na Palestina. Também Marina Tabassum, uma das vencedoras, pela mesquita que projetou no Bangladesh, poderia entrar na conversa. Por email, a arquiteta conta ao DN que Bait Ur Rouf, o nome árabe da mesquita, significa "Casa dos Compassivos". Conta que aquele terreno era da sua avó, que o doou para algo de que a comunidade precisava, naquele sítio de Daca que cresceu depressa e sem planeamento. Acabaria por morrer antes do projeto ficar concluído. Ajudada por outros, Marina conseguiu reunir os 150 mil dólares que precisava para levar a cabo a obra. Usando materiais e técnicas tradicionais do seu país, Tabassum criou um lugar de oração que a luz do sol vai pintando (e salpicando) de forma diferente ao longo do dia. Não queria símbolos. Não há cúpulas nem minaretes naquela mesquita. "Acredito que a quintessência da tradição não é adorar cinzas, mas preservar o fogo", explica. Ela mesma muçulmana, diz que o país está a recuperar do atentado de julho: "Na altura em que vivemos temos de nos preparar para todas as situações. Não é medo o que se sente no ar, mas ansiedade." Com o dinheiro do prémio que lhe coube, e que é dividido entre "arquiteto, cliente, engenheiros, etc. ", planeia "construir um pequeno edifício, uma oficina para pesquisa de material local, tecnologia, etc." Em breve, todos os vencedores devem juntar-se na cerimónia do prémio, no forte de Al Jahili em Al Ain, Abu Dhabi. 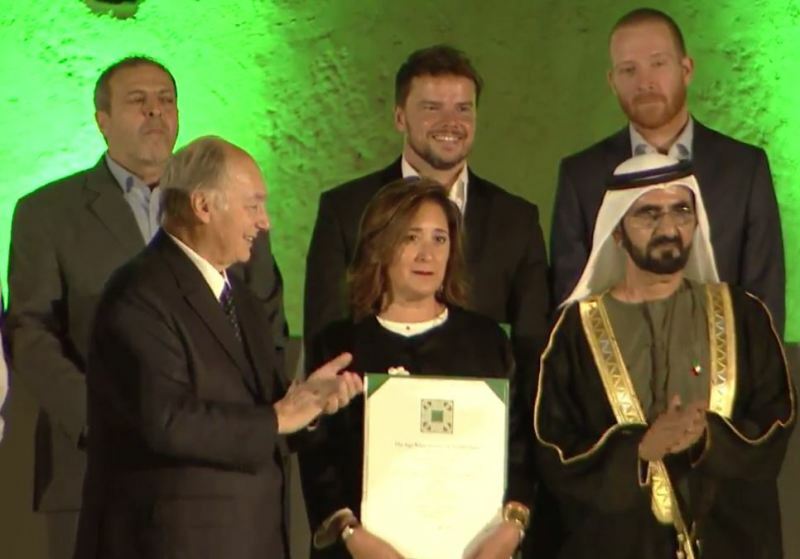 More: The Aga Khan Award for Architecture presented by Mawlana Hazar Imam at a ceremony held at the Al Jahili fort in Al-Ain, United Arab Emirates on Sunday, 6 November 2016. 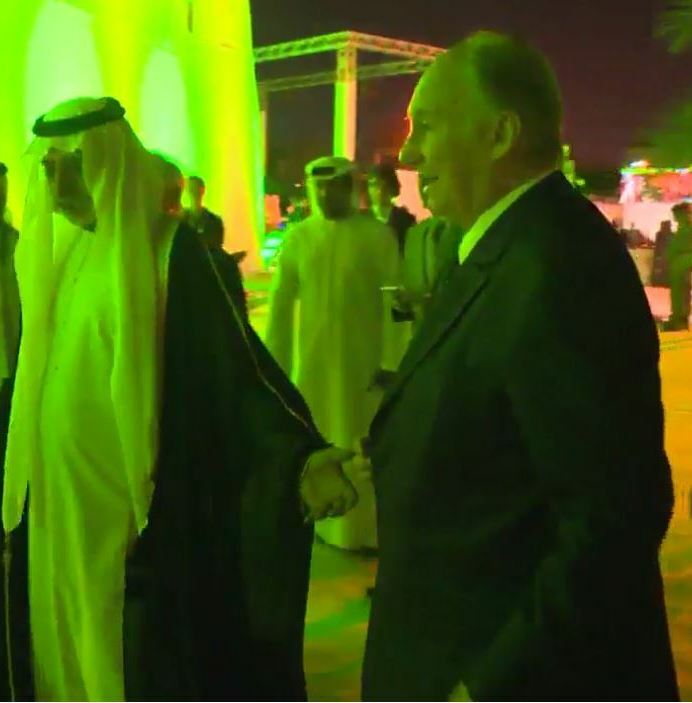 Our Imam was accompanied by Prince Amyn, Prince Hussain and Prince Aly-Muhammad. 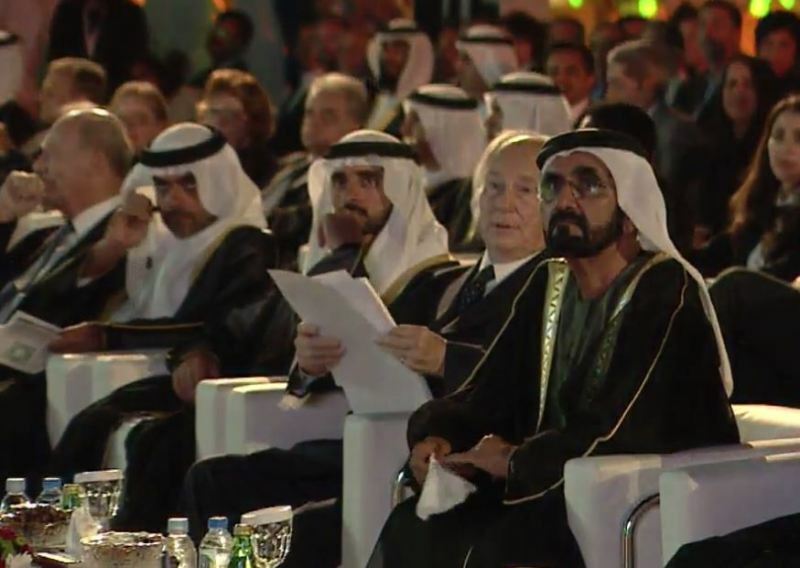 Shaikh Mohammad Bin Rashid Al Maktoum, Vice-President and Prime Minister of the UAE and Ruler of Dubai joined H.H. 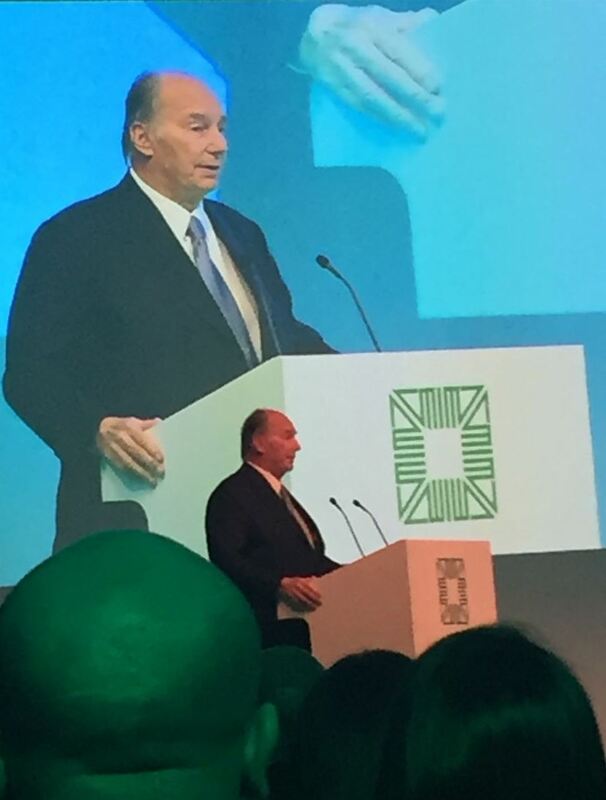 The Aga Khan to present the awards. 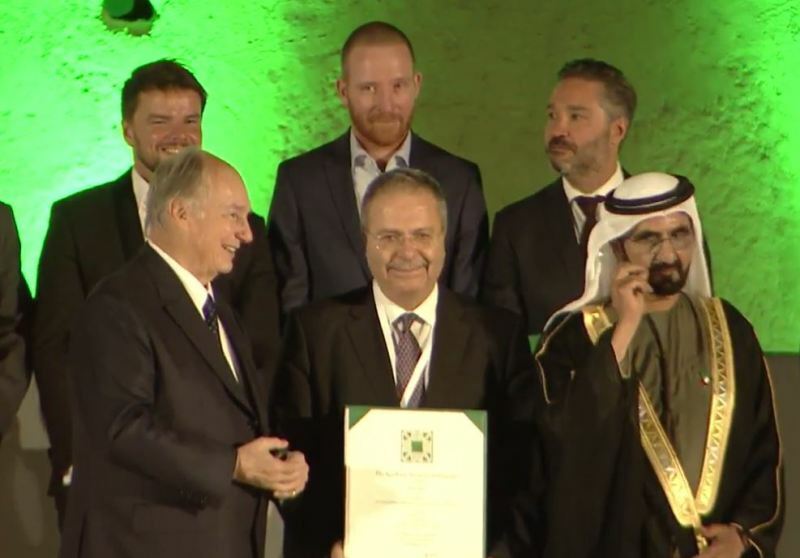 Shaikh Mohammad and Aga Khan with the winners after the presentation of the Aga Khan Award for Architecture. 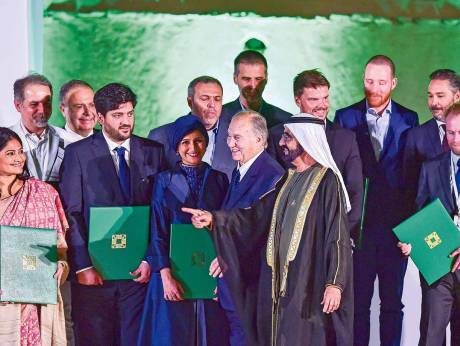 Al Ain: The people behind the creation of what has been judged the Muslim world’s six best new structures scooped up a Dh3.67 million prize on Sunday, in a sparkling ceremony held at the historic Al Ain fort. 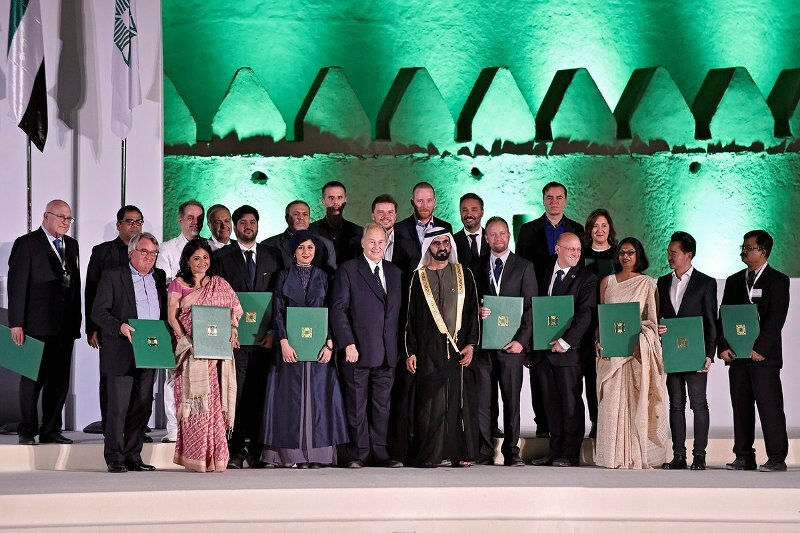 The prizes for the 20 winners of the Aga Khan Award for Architecture were presented by His Highness Shaikh Mohammad Bin Rashid Al Maktoum, Vice-President and Prime Minister of the UAE and Ruler of Dubai. 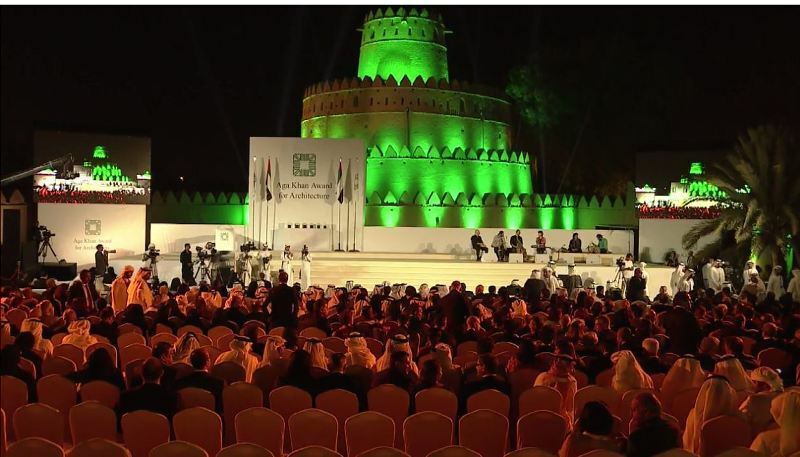 Shaikh Mohammad and his entourage had earlier arrived at Al Jahili fort, its towering walls bathed in flood-lit green to mark the occasion. As he walked through 125-year-old fort’s arched stone entrance, a hushed silence fell over the crowd of architects, urban planners, award officials and journalists. Joining Shaikh Mohammad on the stage to present the prizes was Prince Kareem Aga Khan, the spiritual leader of around 25 million Muslims and the award’s creator. 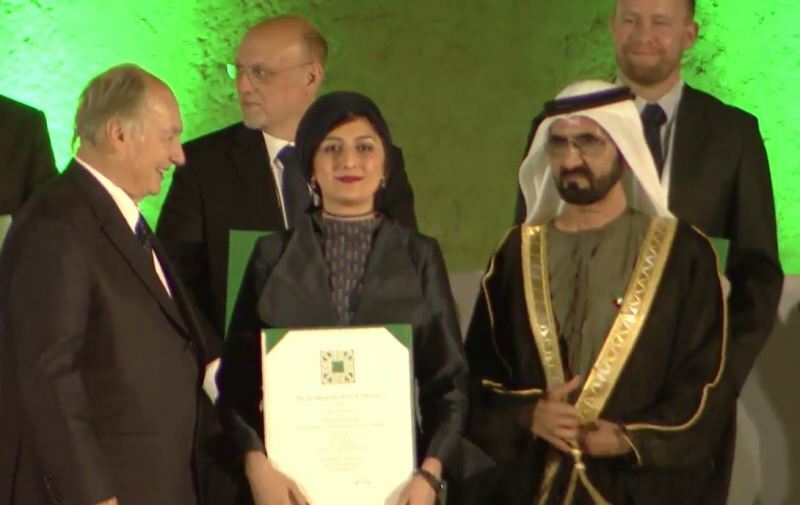 SPEECH - The Aga Khan Award for Architecture presented by the Imam of the Ismailis at a ceremony held at the Al Jahili fort in Al-Ain, United Arab Emirates on Sunday, 6 November 2016. It is a genuine pleasure to welcome you to the 2016 ceremony of the Aga Khan Award for Architecture. As you may suspect, I have the privilege of attending many wonderful ceremonies as I carry out my responsibilities. But this Architectural Award Ceremony is one of those that I look forward to with a special sense of anticipation. Perhaps that is partly because it happens only once every three years – there is more time for the anticipation to build up! But there is a much more important reason: Architecture is the only art form which has a direct, daily impact on the quality of human life. Again this year, the award shines a spotlight on six architectural masterpieces – calling attention to them not only within the professional community, but with the global public as well. In doing so, we believe the Award can help instruct and inspire those who will shape the future of Global Architecture. The Award seeks to guide and inspire better building in the future. At the same time, of course, the Award Ceremony gives us a welcome opportunity to look back. The purpose of the Award when it was first launched was to help renew one of the world’s great cultural legacies, the rich traditions of Islamic architecture. Those traditions were being lost, we feared, amid a rush of modernising, westernising enthusiasms - depriving people everywhere of the insights, the intuitions and the idioms of some of the richest cultures in world history. There was a genuine sense of urgency about the effort to reclaim that precious heritage. How appropriate it is that we meet this evening at this magnificent Fort, a beautiful example in its own right of thoughtful historic preservation. As we gather in this special place – and for this special purpose – we hope to remind people everywhere, of all backgrounds and identities, of a powerful lesson: The way in which a thoughtful concern for the built environment can characterise an entire civilisation. When I speak of a thoughtful concern for the built environment, I think of several qualities which the Award seeks to honour and to promote. Let me mention just four of them. I think, first, of how great architecture can integrate the past and the future – inherited tradition and changing needs. We need not choose between looking back and looking forward; they are not competing choices, but healthy complements. We can learn valuable lessons from history without getting lost in history; we can look boldly ahead without ignoring what has gone before. Secondly, I think of how architectural excellence can integrate the Gifts of Nature and the potentials of the Human Mind. Natural Blessings and Human Creativity are Divine gifts – and it is wrong to embrace one at the expense of the other. The best architecture teaches us to engage with Nature respectfully; not by conquering or subduing it, nor by isolating ourselves away from it. Our host country, the United Arab Emirates, itself offers impressive examples of integrating well the natural and the human environments. A third quality we see in the projects we honour tonight is the balance between aesthetic inspiration and practical utility. Throughout history, the challenges of change have been central to the architectural mission. But today, the pace of change has been accelerating so fast that it sometimes seems overwhelming. Technological changes have revolutionised our lives in communication and travel, industry and agriculture, medicine and education. Natural changes – including Global Warming – also present central challenges. In a globalised world, dangerous threats can circulate more widely and quickly: weapons and pollution, drugs and crime, disease and terrorism, poverty and violence. One result has been an unprecedented increase in the migration of displaced peoples. Some of these problems directly challenge the architectural world. At a time when old ties of community seem to erode, a sense of discipline and personal responsibility can also be diluted. In such contexts, we hear more about professional incompetence, deteriorating engineering and building standards, and even dishonest contracting practices. All of these realities – technological, economic, social and ethical – present important challenges for responsible architecture. The projects we honour tonight have addressed such challenges, each engaging with the particular demands of its own time and place, while expressing the important values of cultural continuity. A fourth major value that the Award for Architecture seeks to highlight is the Spirit of Pluralism – an approach to life that welcomes difference and diversity – one that embraces diversity itself as a Gift of the Creator, honouring cultural differences as the valued legacies of our predecessors. The Spirit of Pluralism has been central to the great achievements of past Islamic cultures, and it remains a central principle for these Awards. One of the questions we addressed four decades ago was how the selection process for the Award could best reflect the pluralism of peoples and of their habitats. One response was to set up a three year selection cycle – a schedule that would encourage wide-ranging discussion among a diversified array of participants. Through the years, they have included architects, philosophers, artists, and historians from diverse faiths, cultures and places – people of different generations and genders. I am happy to underline that three of the awardees this year are women architects. We have drawn upon governmental and foundation friends, urban planners and village leaders, educators and researchers, engineers and financiers, and builders large and small. To all who have contributed their time and talents to the Award process over the past three years – and down through all the years – we extend our deepest appreciation. The Spirit of the Award has been an inclusive one, valuing all manner of buildings and spaces from skyscrapers to mud huts, from residences to work and gathering spaces, from reforestation and financing projects to cemeteries, bridges and parks, from the accomplishments of signature architects to those of anonymous craftsmen. This pluralistic approach may not echo the usual definition of the word “architecture”, but it is the closest we can get to the central inclusive message we want this Award to convey. The jury again this year has explored projects that extend the boundaries of the architectural discipline itself, recognising that new knowledge sometimes emerges in the lines between old categories. In doing so, they have acknowledged how the architectural endeavour can provide stages on which the tensions of our time can be choreographed and negotiated, bridging, for example, the gap between the cosmopolitan and the local. Great architecture can remind us that Pluralism begins with difference, and that it does not require us to leave behind our cherished identities. That is why Pluralism, the fourth of the qualities I have discussed, is so important to the architectural mission. 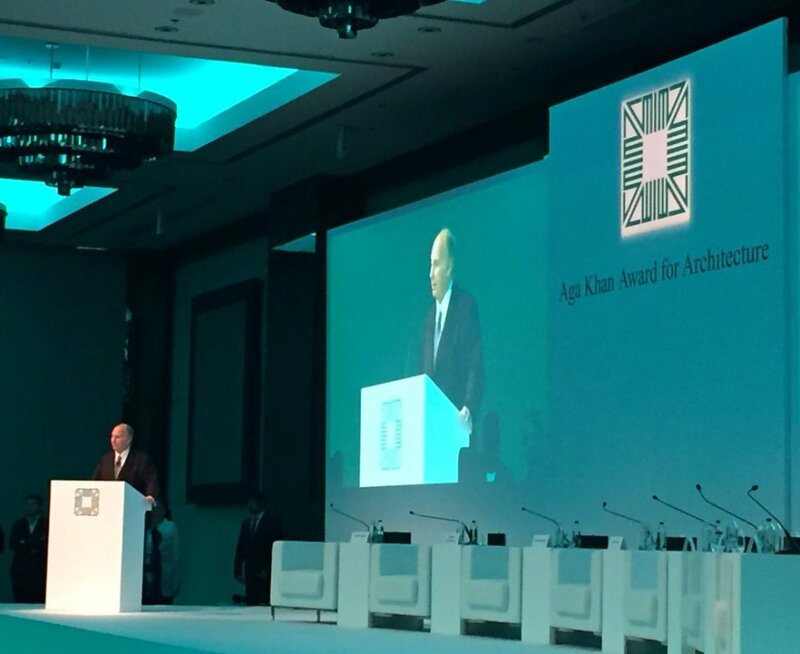 These four qualities, I would submit, are worth bearing in mind as we mark the Thirteenth Presentation of the Aga Khan Award for Architecture: The integration of the Past and the Future, the harmony of Nature and Humanity, the Adaptation to Unprecedented Challenges, and the dedication to Pluralistic Ideals. The six architectural projects we celebrate this evening reaffirm the Award’s Founding Principles, even as they help us project those principles into the programme’s fifth decade. The Holy Quran commands humankind to shape our earthly environment, as good stewards of the Divine Creation. In that spirit, in moments both of elation and disappointment, we hope that the Aga Khan Award for Architecture will always point towards an architecture of optimism and harmony, a powerful force in elevating the quality of human life. 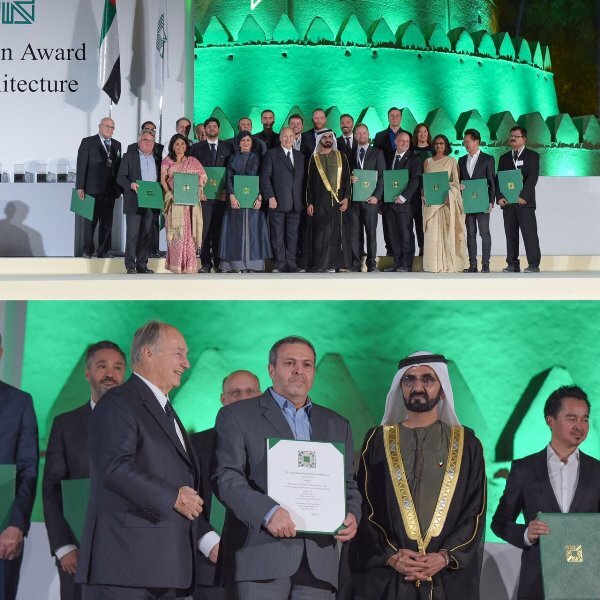 Al-Ain, UAE, 6 November 2016 – The winners of the Aga Khan Award for Architecture were celebrated in a glittering tribute at the Al Jahili fort in Al-Ain, UAE, in the presence of His Highness Sheikh Mohammed bin Rashid Al Maktoum, Vice President and Prime Minister of UAE, Ruler of Dubai, His Highness Prince Karim Aga Khan, Chairman of the Award, and various dignitaries from the United Arab Emirates and abroad. 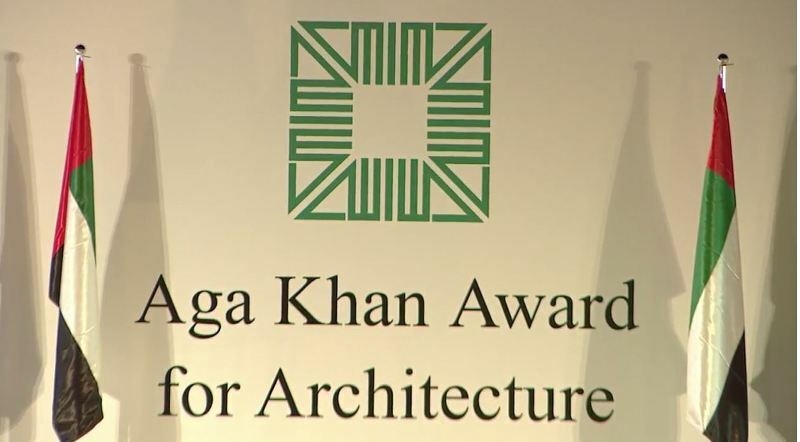 The Aga Khan Award for Architecture is one of the oldest and most prestigious awards in architecture. It was established by His Highness the Aga Khan in 1977 to identify and encourage building concepts that successfully address the needs and aspirations of communities in which Muslims have a significant presence. Bait Ur Rouf Mosque, Dhaka (Architect: Marina Tabassum): A refuge for spirituality in urban Dhaka, selected for its beautiful use of natural light. Friendship Centre, Gaibandha (Architect: Kashef Chowdhury / URBANA): A community centre which makes a virtue of an area susceptible to flooding in rural Bangladesh. Micro Yuan’er Children’s Library and Art Centre, Beijing (Architect: ZAO / standardarchitecture, Zhang Ke): A children’s library selected for its embodiment of contemporary life in the traditional courtyard residences of Beijing’s Hutongs. Superkilen, Copenhagen (Architects: BIG – Bjarke Ingels Group, Topotek 1 and Superflex): A public space promoting integration across lines of ethnicity, religion and culture. Tabiat Pedestrian Bridge, Tehran (Architect: Diba Tensile Architecture / Leila Araghian, Alireza Behzadi): A multi-level bridge spanning a busy motorway has created a dynamic new urban space. Issam Fares Institute, Beirut (Architect: Zaha Hadid Architects): A new building for the American University of Beirut’s campus, radical in composition but respectful of its traditional context. Ceremonies to announce the winning projects and mark the close of each triennial cycle are always held in settings selected for their architectural and cultural importance to the Muslim world. Today’s ceremony was held at the Al Jahili Fort, a UNESCO World Heritage Site in Al Ain, Abu Dhabi. Construction of Al Jahili Fort began in 1891 under Sheikh Zayed the First. Completed in 1898, it remained a residence of the Al Nahyan family for many years. It underwent a comprehensive rehabilitation between 2007 and 2008 by the Abu Dhabi Authority for Culture and Heritage with the collaboration of Eike Roswag, an Aga Khan Award for Architecture winner in 2007. The Fort was declared a UNESCO World Heritage Site in 2011. Previous venues for Award ceremonies encompass many of the most illustrious architectural achievements in the Muslim world, including Shalimar Gardens in Lahore (1980), Topkapi Palace in Istanbul (1983), Badi’ Palace in Marrakech (1986), the Citadel of Saladin in Cairo (1989), Registan Square in Samarkand (1992), Karaton Surakarta in Solo (1995), the Alhambra in Granada (1998), the Citadel of Aleppo (2001) and the gardens of Emperor Humayun’s Tomb in Delhi (2004). Over the last 39 years of the Award, prizes have been given to projects across the globe, from France to China. Architects and planners from New York to Dhaka have received one of 116 awards. During the nomination process, more than 9,000 building projects were documented. Over the course of the last 39 years, most of the great architects of our time have either won the Award or served on its Master Jury or Steering Committee, from Zaha Hadid to Norman Foster, Charles Correa to Frank Gehry, Jean Nouvel to Hassan Fathy. The Aga Khan Award for Architecture selects projects – from slum upgrading to high rise “green” buildings – that not only exhibit architectural excellence but also improve the overall quality of life. Because these achievements typically involve successful collaboration between many people, the Award recognises mayors, builders, clients, master craftsmen, engineers and end-users – as well as architects. Suad Amiry, Founder, Riwaq Centre for Architectural Conservation, Ramallah; Emre Arolat, Founder, EAA – Emre Arolat Architecture, Istanbul; Akeel Bilgrami, Sydney Morgenbesser Professor of Philosophy, Columbia University, New York; Luis Fernàndez-Galiano, Editor, Architectura Viva, Madrid; Hameed Haroon, Chief Executive Officer, Herald Publications, Karachi; Lesley Lokko, Head, Graduate School of Architecture, University of Johannesburg, Johannesburg; Mohsen Mostafavi, Dean, Graduate School of Design, Harvard University, Cambridge; Dominique Perrault, Founder, Dominique Perrault Architecture, Paris; and Hossein Rezai, Director, Web Structures, Singapore. His Highness the Aga Khan (Chairman); David Adjaye, founder and principal architect of Adjaye Associates, which has offices in London, New York and Accra; Mohammad al-Asad, the founding director of the Center for the Study of the Built Environment in Amman, Jordan; Francesco Bandarin, Assistant Director-General for Culture at UNESCO, Paris, France; Hanif Kara, a practicing structural engineer and Professor in Practice of Architectural Technology at the Graduate School of Design at Harvard University; Kamil Merican, founding partner of GDP Architects Malaysia; Azim Nanji, a social scientist who is Special Advisor to the Provost at the Aga Khan University and a Member of the Board of Directors of the Global Centre for Pluralism in Ottawa; Professor Gülru Necipoglu, Aga Khan Professor of Islamic Art at Harvard University; Brigitte Shim, a principal in the Toronto-based design firm Shim-Sutcliffe Architects and Professor at the John H. Daniels Faculty of Architecture, Landscape and Design at the University of Toronto; and Yu Kongjian, founder and dean of the College of Architecture and Landscape and the Changjiang Chair Professor of Design, at Peking University. Farrokh Derakhshani is Director of the Award. For a full on-line press kit, which includes briefs on each of the winning projects, high resolution images, broadcast-quality video (for use by television stations and websites) and other information, please see www.akdn.org/2016AwardWinners. For further information, please send an email to the press contacts listed at the bottom of this press release. On 5 November, a seminar drawing in municipal planners, architects and architect students from around the globe was held in the Dubai Ballroom at the JW Marriott Marquis in Dubai. Each of the winning architects discussed the process by which they came to design their buildings. 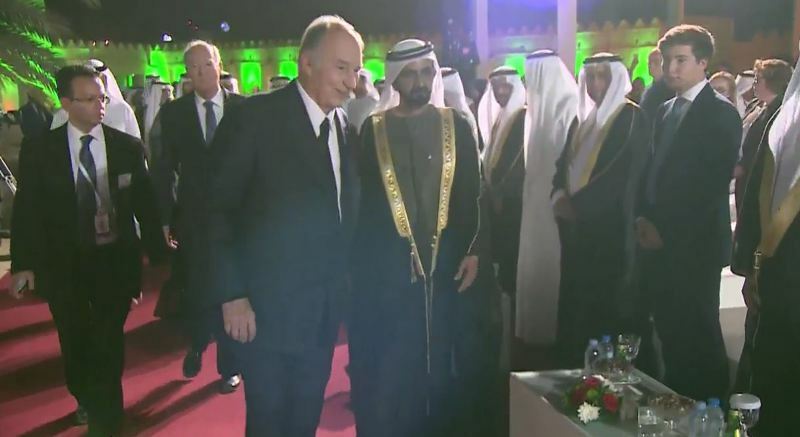 His Highness Prince Karim Aga Khan, the founder and chairman of the AKDN, is the 49th hereditary Imam (Spiritual Leader) of the Shia Ismaili Muslims. He is a direct descendant of the Prophet Muhammad (peace be upon him) through his cousin and son-in-law, Ali, the first Imam, and his wife Fatima, the Prophet’s daughter. In Islam’s ethical tradition, religious leaders not only interpret the faith but also have a responsibility to help improve the quality of life in their community and in the societies amongst which they live. For His Highness the Aga Khan, this has meant a deep engagement with development for over 50 years through the agencies of the Aga Khan Development Network. The Aga Khan Award for Architecture is part of the Aga Khan Trust for Culture (AKTC), which has a wide range of activities aimed at the preservation and promotion of the material and spiritual heritage of Muslim societies. As the cultural agency of the Aga Khan Development Network (AKDN), the Trust leverages cultural heritage as a means of supporting and catalysing development. Its programmes include the Aga Khan Historic Cities Programme (HCP), which works to revitalise historic cities in the Muslim world, both culturally and socioeconomically. Over the last decade, it has been engaged in the rehabilitation of historic areas in Cairo, Kabul, Herat, Aleppo, Delhi, Zanzibar, Mostar, northern Pakistan, Timbuktu and Mopti. The Aga Khan Music Initiative (AKMI) is an interregional music and arts education programme with worldwide performance, outreach, mentoring, and artistic production activities. The Aga Khan Museum in Toronto presents an overview of the artistic, intellectual and scientific contributions that Muslim civilizations have made to world heritage. The Trust also supports the Muslim arts and architecture departments of Harvard University and the Massachusetts Institute of Technology (MIT), as well as www.ArchNet.org, a major online resource on Islamic architecture.